Monday through Friday 7:30am. - 4:00pm. We are closed on holidays and weekends. 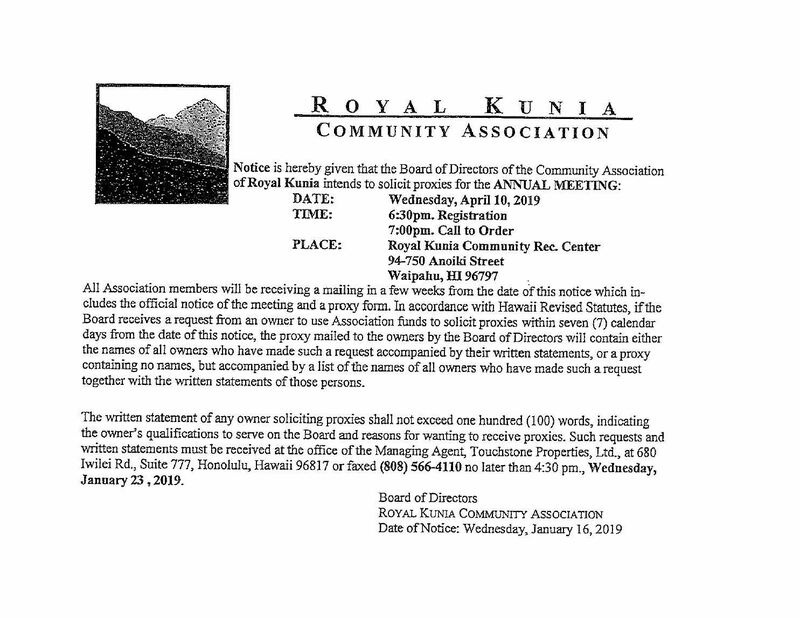 Royal Kunia Community Association does NOT participate in any social media websites or activities such as Facebook, Instagram, Twitter, or Yelp. This website (http://royalkuniacommunityassociation.org) is the official and only website for notices and information regarding the Royal Kunia Community Association. Please click HERE for more information. Click HERE for a blank proxy to fill out. If you should need assistance in finding your Unit/Lot Number(s), please call our office at 688-9000. Starting April 1, 2019, your refuse and recycling collection days will change. Please click HERE for the partial 2019 calendar with your new collection schedule. Visit opala.org to download your full 2019 collection schedule - click the "Collection Schedules" link. Should you have any questions, please call 768-3200 Ext. 3. This new schedule is for Royal Kunia homeowners except for Site 299 (Hanauna, Heahea (Place & Street), Eleu, Puia, Leia, and Makoa Streets). Those named shall keep to current refuse pick up schedule. Castle & Cooke through Ron's Construction will be in the Site 5 Area repairing sidewalk panels. As of January 1, 2019, the Royal Kunia Community Association will be moving management companies from Hawaiiana Management to Touchstone Properties. If you have not received your coupons from Touchstone Properties, please contact our office. Click HERE for updated contact information. Click HERE for Marcy's Meet-Up page for more information. 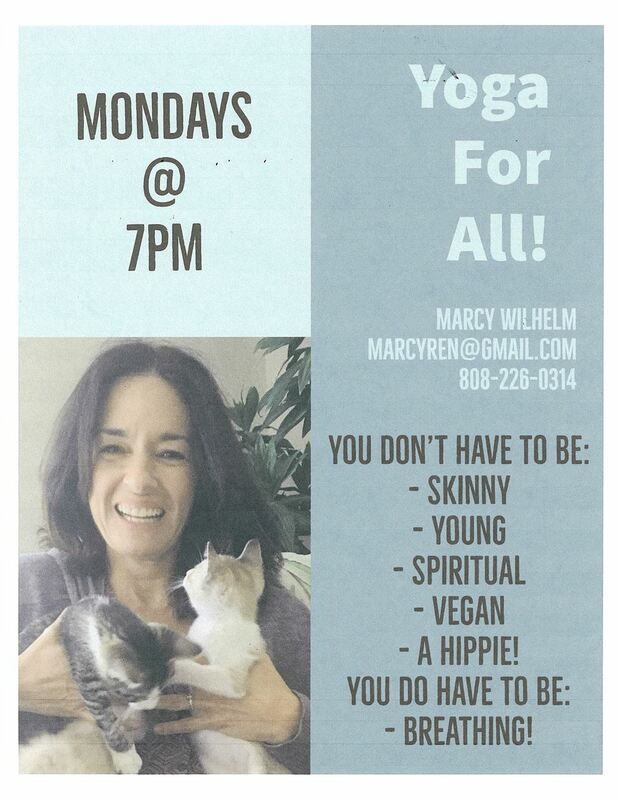 Mondays at 7:00pm at the Community Recreation Center will be holding a free Yoga Class for Homeowners and Residents of the Royal Kunia Community Association. 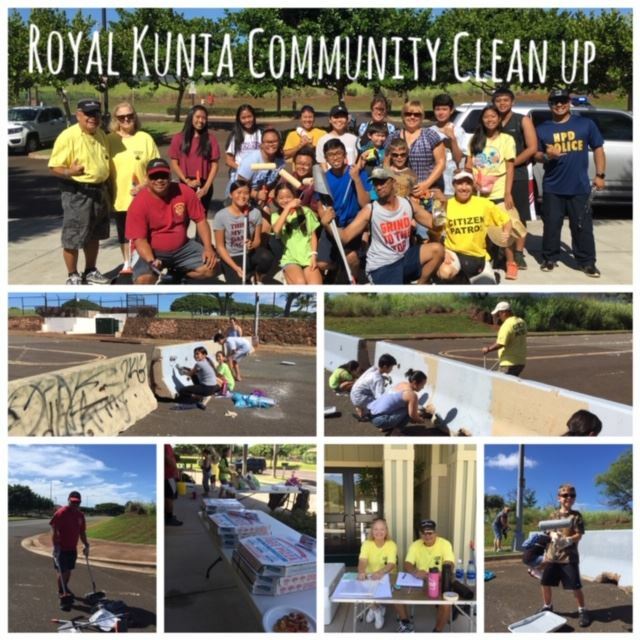 Credit to Skye Yasuda, Connie Respicio, and Officer Kaipo Paiva for organizing a successful Community Clean-Up in the Royal Kunia Subdivision. Thank you to all the volunteers that came out to beautify our neighborhood! UPDATE: Our Events Page is now up and running! Please click HERE or the EVENTS link to get information of what is happening in and around our Community. Click HERE to read information on spaying/neutering stray cats. A friendly reminder that Bulky Item Pick Up is done on the second week - Wednesday to Saturday of every month (Click HERE for the Bulky Pick Up Calendar). Please bring your items out to the front on the Tuesday BEFORE scheduled pick up. For more information or if you have questions regarding Bulky Item Pick Up, please call 768-3200. Please click HERE to have our community's voice heard. Please inform the Governor to reconsider and oppose his intent to veto, and provide your comment(s). SB 2524 is applicable to Oahu only; Neighbor Islands are not affected. You may also call the Governor's office directly at 586-0034. Ask for the name of the person you will be speaking with. If you have received this notice on your door, please be advised that this company does not work with the Association, nor did the Association give the approval for them to solicit our homeowners. Click HERE for the map showing the vacant land parcels. 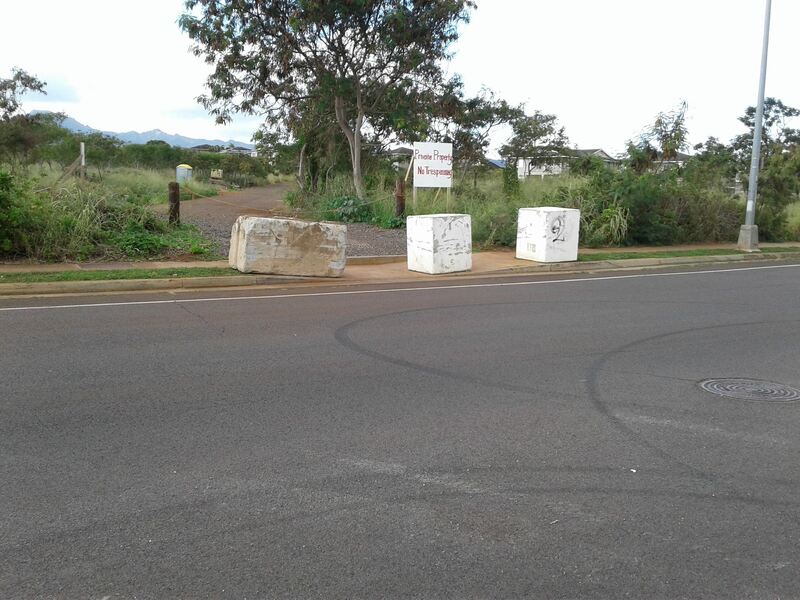 Concrete block barriers installed by Kunia Residential Partners. Sidewalks are open for pedestrian use and wheel chairs. There has been multiple reports of break-ins and property being stolen in our neighborhood. Please do not leave valuables in your car. For any suspicious activity we strongly encourage that you call the Honolulu Police Department (911) immediately. There is a roofing contractor that is misinforming homeowners with Association Approved Colors (Silver Birch/Birchwood/Weathered White). The same contractor is misleading homeowners that approval has been obtained on their behalf. PLEASE be reminded that your contractor may assist you with your Design Application, but it is your duty as a homeowner to submit your application. Prior approval must be obtained before work can be done. For any questions, please feel free to call your Association Office. Effective 2012, Call to Order for monthly Board Meetings is 6:00pm.